Have you found an online vendor selling Flor de Cana 25-Year? Im inclined to rate the Flor 25 as a 10, but I too feel its overpriced at well over a 100 euro's. The packaging and bottle are really swanky though. You do feel you are buying something special. Tastewise this one sits halfway between the Flor 18 (lots of caramel, oak and vanilla) and the Flor 12 (zesty and spicy). But its smoother than both. You can feed this to a baby. Its has no burn whatsoever. Also it is, as expected, more complex than both. Less sweet than the 18, slightly more adult and masculine tasting. There's a hint of old books in the smell and taste. But delicate too at the same time. Let it sit and breath, clean your palate and taste consiously otherwise it won't register fully. Definitely adding this to my sipping rum list. There isn't anything about this rum that I don't like. The aroma in the bottle is awesome. I cannot really describe it save to say it smells wonderful with just a little bit of sweetness. The flavor is simply luscious. Silky smooth on the tongue with subtle sweetness married brilliantly with soft oakiness leading to an enveloping warmth and leaving with a satiny vanilla aftertaste. Sounds like something from a romance novel but frankly this rum will evoke romantic notions. This is a very special rum well worth the $100+ price. Highly recommended! In my humble opinion, having this as anything other than a sipping rum would be criminal. As close to a 10 as I can get thus far. En la copa, tiene un color ámbar oscuro. En la nariz, hay caramelo, vainilla, almendra amarga y aromas de roble suaves. En boca, es seco, no tan fuertemente amaderado como era de esperar de un 25 anos. Las notas de madera se equilibran junto con caramelo, vainilla y almendras amargas. Beautifully balanced wood, caramel, vanilla notes. Very smooth and soft nose. When I buy a Rum I expect it to tast like Rum. This rum has been aged so long in sherry cask that it has taken on the tast. I think there best rum is the 7 year old, it tastes like rum. I tried all of the them collection. 25YO - ok is the best. Very good balance, nice nose and colour. It is good rum but sorry...worst one from 25YO rum what I drunk. For 25YO you expected more. Disappoitment. Flor de Cana 25-Years comes in a very nice and classy black box. You really have to let this rum rest in the glass. I think the equation one minute per year old works fine. The sticky alcohol disappears and smooth aromas of caramel, vanilla, honey and oak becomes clearer. Flor de Cana 25-Year is very smooth and you taste nice flavours like vanilla, caramel, dark chocolate, oak and a little bit of smoke. You also get some spice. Flor de Cana 25-Year is less sweet than expected. The aftertaste is smooth and long. This is a very good rum but it has a bit too much oak and spice for my taste. 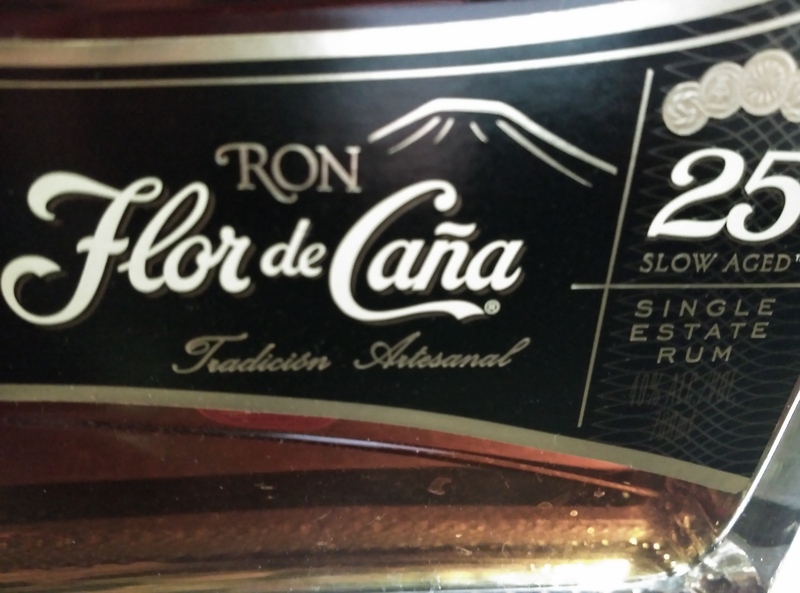 Flor de Cana 25-Year is a bit dry and I like my rums a little bit sweeter. Sugar: estimated at 15 GPL. I found this rum to be sweeter than any of the other rums in the Flor de Cana lineup and I like my rums in the 15 to 20 GPL range. It's my opinion that this is the All Star rum in the Flor de Cana lineup. Can't help myself, it's World Series time of the year. You will find this to be a perfectly balanced mixture of oak, vanilla, caramel, with a hint of smoke, spice and maybe a touch of leather in your glass. Smooth on entry then an explosion of the flavors mentioned. All of this is followed by a nice long warm aftertaste. Note: Let this breath a bit before sipping. This rum is in the same league as the Abuelo Centura and not surprisingly it's the same price. Save this rum for special occasions or it will be gone before you know it. Tastes like a classic, smooth rum. Problem is I just won't remember it in a few days. End of the bottle so not as aromatic as it should be i guess. Discreet nose compared to the 18 years old. Aromas of dried apricot and orange. Long oaky finish. Woody, grilled toasty bread flavors. Taste of sweet aromas of almonds, nougat,raisins,chocolate,cherry and apple caramelized, a bit spicy. My experience with this one was a bit disapointing.. Lack of rich taste and complexity. A bit harsch on the nose. A possible high expectation, but this was what my pallets told me. It is very good, just did not live up to the hype. It is strong and bold. Flor De Caña has a very good catalog. This is the only one I probably won't buy again because it's priced way beyond what it's worth. You get a slightly less defined flavour from their 18 year at a quarter of the price. Far better value there. Classic rum taste, smooth caramel, hints of oak. Full body, subtle sweet, soft oak very classy. One of my favorites. Barevné zlato v lahvi. Již sklenice napovídá, že se nebude jednat o jen tak nějaký rum. Jeho vůně je kouzelná,lehce připomínající čokoládu i trochu vanilky. Tuto láhev si dokážu představit do své sběratelské poličky. Smooth and clean . No sweet at all. Let it sit and breathe for a short wile. Excellent! Perhaps a bit overpriced; but very tasty and extremely smooth. One of the smoothest rums I have ever had. So easy to sip straight. End of bottle. Toasty nose with a hint of hazelnut. Grilled flavours in mouth and long smooth finish, more buttery, balanced. Not a favorite but a good rum. Nice Rum, the first Impression was the strong smell of Alkohol. First Taste was .....whow, not much Sugar. Flor de Caña 25 year is top of the line, smooth rum with strong caramel and osk aroma that compeyes well with Ron Zacapa from Guatemala. It is outstanding to sip after dinner with ice cube in a tropicsl setting outdoors accompanied by a Montecristo. This is lovely. Smooth. It’s a quality bottle for a quality rum.